Start your day with a delightfully easy blueberry surprise. Sweet and delicious, these 2 minute mugcakes will be sure to leave you starting your day on a high! 1. Taking a bowl, mix all the ingredients together, leaving a few blueberries aside to sprinkle on top of mugcakes. 2. 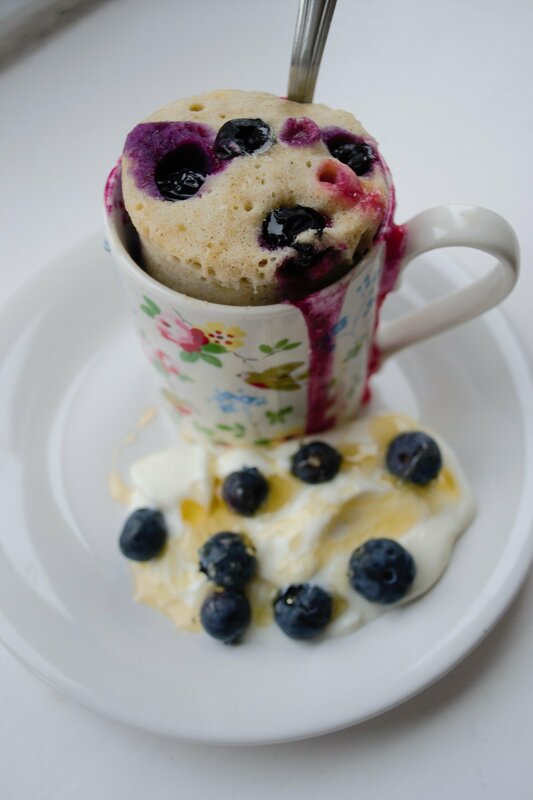 Distribute the mixture evenly into 2 microwaveable mugs, and sprinkle a few blueberries on top of mixture. 3. Place in the microwave for 2 minutes. 4. Remove and serve alongside some dairy free yogurt and fruit. Enjoy!